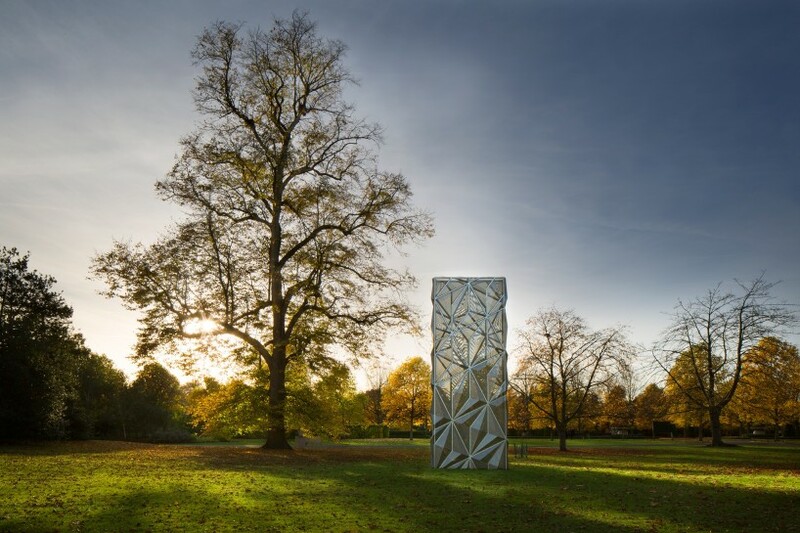 A new six-metre-high sculpture by Conrad Shawcross, Monolith (Optic), goes on view in Regent’s Park (6 October 2016 - 8 January 2017) to coincide with the unveiling earlier this month of the artist’s most ambitious public commission to date. The Optic Cloak is a major architectural intervention for the Greenwich Peninsula low carbon Energy Centre in south-east London. It was commissioned by Knight Dragon and designed in collaboration with the architectural practice of C.F. Møller Architects. The work unites sophisticated engineering and complex optical research and draws on sources as diverse as maritime camouflage, Cubism and Op Art. Unveiled on September 21, the structure – 49 metres high by 20 metres wide and 3 metres deep – is both monumental and visually dynamic, utilitarian and beguiling, created in sympathy with the design and ethos of the Energy Centre while appearing continually to change in different lighting conditions and as viewers move around it. The Optic Cloak is a cultural partnership between Conrad Shawcross and Knight Dragon and was brokered by Futurecity. Selected by Clare Lilley (Director of Programme, Yorkshire Sculpture Park), Frieze Sculpture Park 2016 comprises 19 new and historical works, set in the English Gardens between Frieze Masters and Frieze London. Following Frieze London, the works will remain on view until 8 January 2017.